Publicado el 8 abril 2019 8 abril 2019 de Octavio Islas. Fundador de la revista científica Razón y Palabra. The Department for Digital, Culture, Media and Sport and the Home Office has released the long-awaited ‘Online Harms White Paper’ setting out new proposals to regulate online and social media platforms. It would put a mandatory duty of care on platforms to protect their users, within reason, from a range of harmful content. The proposed laws would apply to any company that allows users to share or discover user generated content or interact with each other online. The government says a new independent regulator would be introduced to ensure internet companies meet their responsibilities. This new body’s powers could potentially include the right to impose financial penalties and even jail time to top executives who don’t do enough to ensure harmful content is removed from their platforms. Snapchat has announced a new API, called App Stories, which will allow third-party apps – such as Tinder and Houseparty – to share Snapchat Stories directly to their own apps. In addition, Snap has introduced a new ad format called Ad Kit that will enable app makers to target their ads to Snapchat users outside of the platform by using its new ‘Audience Network’ to re-use vertical video ads. The new product won’t launch for a few months yet and details on exactly how it will work are still to be confirmed. Snapchat has begun its worldwide roll out of Snap Games, a new platform which lets you play real-time, multiplayer games while texting and talking with friends. Snap recruited developers to build games exclusively for its vertical, real-time multiplayer format – with five games currently available to users. To monetise the platform, Snapchat will let users opt-in to watching six-second unskippable ads in order to receive rewards such as power up or bonus in-game currency. It plans to split the revenue from these ads with developers. 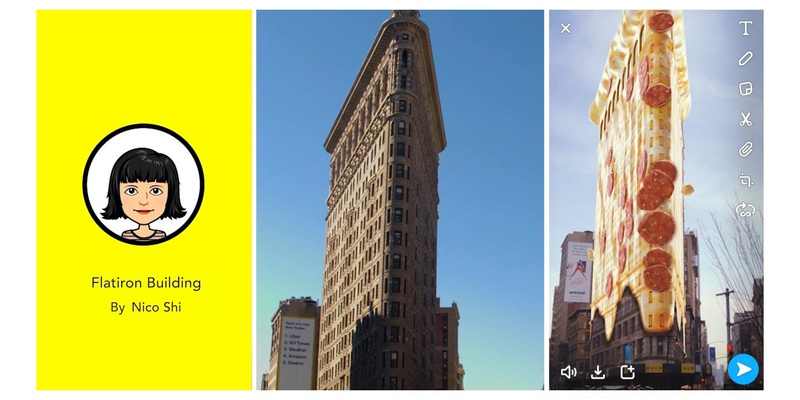 Snapchat has introduced several updates to its Lens suite of tools including ‘Landmarks’ which lets you bring five global landmarks to life through AR Lenses – with more landmarks to be added in the future. In addition to Snapchat’s own Lenses, Lens Creators can build additional Lenses for these locations and brands have the option to develop Landmark experiences. Harking back to the good old days of Foursquare, Snapchat has begun testing a new feature called ‘Status in Status Maps’ with a select few users in Australia. The new feature will let users check into places and allows friends to see what they’re up to by selecting a Bitmoji which best represents the activity. The new feature will also enable users to build up a list of places they’ve visited in their ‘Passport’. Twitter has started testing a new feature which would change its recently trailed ‘original tweeter’ lable to ‘Author’. In addition, the platform is also now adding two new labels, ‘Mentioned’ and ‘Following’, which will be added to other important tweets in conversation threads. ‘Mentioned’ will be added to any tweet shared by someone who the original author referenced in their tweet; while the ‘Following’ label will be added to tweets from Twitter users you’re following, as a way to catch their replies when scrolling through long threads. Users of LinkedIn’s desktop app worldwide can now upload documents and presentationsto their feeds, groups or pages on the professional network – with its mobile apps to follow in the near future. Users will be given the opportunity to add a brief description to the file, which can include hashtags and @ mentions. As with a standard post, users can also decide who they share the document or presentation with such as connections only, to a group, or publicly on LinkedIn. The post We Are Social’s Monday Mashup #441 appeared first on We Are Social.